I just read somewhere that for FBAR purposes, even when a couple is “married filing jointly” for their USA taxes, if they have joint offshore accounts(in my case they are in our native country), each has to report these accounts separately, even if they are repeated. When we report these accounts in our native country, we file returns or pay taxes as applicable based on who is the primary account holder even though we might have joint accounts – that is how it works there. For eg. I have an account and some CD’s in Bank A and my husband is the joint account holder on it with me. My husband has an account and some CDs in Bank B and there I am the joint -account holder with him. The account and CD’s in Bank A is reported under my name and the account and CD’s in Bank B is reported under his name. Here in USA, my husband is the earning spouse and I am the joint filer. Now for FBAR purposes – do we report both accounts and CD’s with joint names in bank A and bank B on BOTH our FBAR forms? ie. report the same accounts and CDs’ twice and pay penalties on the same accounts TWICE? That would just kill us in the FBAR penalties and it does not make any sense whatsoever!! How can one pay double fines on same accounts?? This is even more absurd, atrocious and illogical than I had previously thought. Our interest income in these accounts in not that much, at the max around 6K each in the last 3 years and the tax might not be that high, but the FBAR penalties would just be ridiculously obnoxious!!! Please, if someone has any kind of idea or suggestion, do share. I was unable to sleep before, now I am alternating between fear of the penalty abyss and anger at the unfairness and thievery of it all! Well, all of our accounts were joint accounts, and we only have filed one FBAR and both signed them. That did not seem to be a problem, as I went through the OVDP without any comment about this. However, all of our accounts were either just in my wife’s name, or both of our names. So she was the main owner, and I was the joint owner. Or at least that is how we filed, and I didn’t have a similar situation to you. We did not have a case where we were separate owners, with the other a joint signer. Now, I suppose it is possible I have missed something. Have you read the instructions on the FBAR? If I had owned an account separate from my wife, then I would have had to file a separate FBAR for that account, and list her as a joint owner for that account only. I wouldn’t worry about the IRS hitting you double for FBAR penalties. They aren’t that ridiculous, no matter how much they bluster. (see Kiro’s post at May 17, 2012 at 5:55 pm ), how did the telephone meeting go, with the manager at IRS ? Turns out the meeting didn’t happen, manager was too busy and is out for 2 weeks for memorial day holiday or something. Not rescheduled yet. Your advice to keep my cool is of course great. It would be hard to do so if the manager mentions inappropriate penalties that they can’t possibly apply as a threat. I must admit it would be tempting to say — yes, lets see you do that, But I’m jumping to conclusions. I think they are likely graded by how many cases they can handle fast, and if they can avoid opt outs, so the manager may offer a settlement. Still unsure if I’ll accept one that is not reasonable. Being semi-retired, I have time to spend on going through appeals if needed. Well, if you have the time and LCUs to burn, then you might as well take what small pleasure you can by delaying and eating up their time and examiner resources with what appeals are available. I would drag out all deadlines and time frames to the last minute allowed. Look for every opportunity to audit their work, find mistakes, and make them correct it before you can proceed. Might has well make it as expensive and inefficient for them as possible, content in the knowledge that they will never get it! I am also in the program, contemplating opt out, with good facts, I think. Your notes are very useful. hopefully the process will be less frustrating for me. I understand from your notes that the IRS came back with an offer of 115K at one point. Did they tell you how they came up with that number ? Was it a %age of account size, using the IRM guidelines etc etc. ? Or was it just an attempt to browbeat you into accepting a very high number (a sort of negotiating tactic) ? Also, do you think your letters and messages to senior IRS personnel helped you at all ? Would someone without such letters be unable to get a hearing ? Did even the TAS listen to you more because you contacted them via your Congressperson (or was it via Americans Abroad) ? It also seems like you had a face to face meeting with your examiner/manager ? Did they try and grill you about your accounts at that time and ask why you didn’t file FBARs ? It also seems from one of your messages that you contemplated moving money back from NZ to pay the fine ? I can only hope and pray that the process is less frustrating for you than me, and that you have a positive outcome. I will take your questions in order…. Did they tell you how they came up with that number ? really an “browbeat” or “negotiating” tactic. Whatever it was, we (TAS and I) rejected straight away. process when I called Kevin a year later to remind him of his letter. way with suggestions or ideas about what to do. the consistency of my arguments, and my attempts to reach resolution. So, the letters served a purpose, but not as directly as you would have liked. Did the TAS listen to you more because you contacted them via your Congressperson (or was it via Americans Abroad) ? to me, but not sure that many had gone the TAS route up to that time. contacted the TAS office. She was right! Did you have face to face meetings? No face to face meetings, just telephone and written correspondence. Did they try and grill you about your accounts at that time and ask why you didn’t file FBARs ? No! No need. It was all in my written correspondence. You contemplated moving money back from NZ to pay the fine? sure to read Moby’s Opt Out. There may be some arguments there you can use. Moby, Just me: thanks to both of you. US, but before I became a US person). In my case, I would be willing to pay up to that in fbar penalties. I think it would be maybe $500-$600 more is all. process. It is what they thought they could get, plain and simple. bit to ‘punish’ people for not taking the 20% bargain offer !! I understand what you are saying, but I don’t make that assumption. it back (probably hoping you will not). around to the reconciliation calculations, so let it be. So, you are reaching back way way way too far in your “rationale” analysis. trying to think logically. Think like a negotiator instead..
find what they will settle for now. forward and not subject to some draconian penalty for a benign failure. then the 20% accuracy penalty sounds pretty reasonable to me. So, you start with an insult, “written by brain dead visitors” and then want more information? Humm. Was that your intention? I just moved “online psychotherapy” to trash. Slipped through our spam filter — judging from his/its url, it’s not even a real person, just one of those spam pests. We get around 800 a day, argh! But the spam filter catches almost all of them. Should have figured it was a phishing operation! If you are inside the OVDI/OVDP… Well worth your read. An anonymous commenter going under the name “Anonymous” posted the comment below. It is a very good comment and solicits other comments, so I am posting it as a blog entry so that readers do not miss the excellent analysis and make comments as appropriate. *@justMe: I skimmed through some of this but what exactly did you not pay in taxes that warranted a 172,000 fine that was later reduced to 25K? Was it just FBAR nonfilings and if so, how many years of delinquent FBARs and how much were the accounts that earned interest that the IRS never received taxes on? Basically, how much money in taxes owed got you to a 172,000 fine? LOL… Yes, you skimmed, and I don’t blame you. Of course, I don’t think anything warranted $172K in penalties, but over six years I ended up owning about ~19K in taxes, less than 1/2 of what Tim Geithner owed, amended and paid NO penalties for, but since this involved failure to file FBARS, they wanted $172K. *@JUSTME If you owed 19K in taxes and they tried to leverage a 172K fine I would claim protection under the 8th Amend! But since you did owe that much and in the end paying 25K was not too bad of an outcome when considering the penalty regime. There is a big lesson-learned here that the penalty scheme is an empty scare tactic that the IRS knows from past experiences most intimidated taxpayers will fork over. My brother and two partners opened a business about 30 years a go and one of the partners was not paying the social security taxes for their employees. When they went bankrupt the IRS came after my brother because the other two partners did not have jobs afterwards and my brother folded in the face of their threats. He wound up paying about 600.00 bucks per month for 6 years. Your long battle would have definitely cost me a lot of life credits like you said but you did not fold. You were rather diplomatic in your letters to the IRS which would have likely chopped my tongue off it was me. Maybe that helped a lot. who knows but we all thank you for sponsoring this forum because it is a tremendous help to all of us minnows. I hope others who get audited tell us their story too wisen us all. God Bless. All the Constitutional arguments just get laughed at by the IRS, and cost of pursuing those quixotic legal theories hit up against the reality of the cost. Ultimately, you must make the “cat surgery decision” I called it, (long story) or a business decision and move on. After wasting 2 years of LCUs in the IRS torturous OVDP processing factory, you settle. Could not have done even that without the help of the TAS at the time, but this was before the ‘opt out’ process had yet been fully implemented and there were no known cases of how they would handle it. Looking back on it, and with my facts, given the record of what has been happening in the Opt Out, I probably would have taken my chances going that route. Not sure my penalty would have been better or worse, but since I sort of “plea bargined”, I settled to end the misery. I did try to remain diplomatic, as I figured yelling at the examiner, or calling them names that I felt like saying, would not benefit me, or make me a sympathetic character. I did keep my wife away from all IRS conversations, as she was really angry that a government would treat otherwise law abiding citizens this way. She was going to apply for her U.S. Citizenship, but forget that now! No way will she do it. I can not confirm, but I understand the reporter is David Kestenbaum. If so, that would be a very positive development. He is very good, imho. The story was carried on NPR. It was ok, sort of, but disappointing in other ways. The narrative was not what I was hoping for. Audio better than the printed copy. NPR would not allow additional comments from me, sad to say, for reasons unknown. and letters received and sent is to be found at Jack Townsend’s Federal Tax Crimes blog. 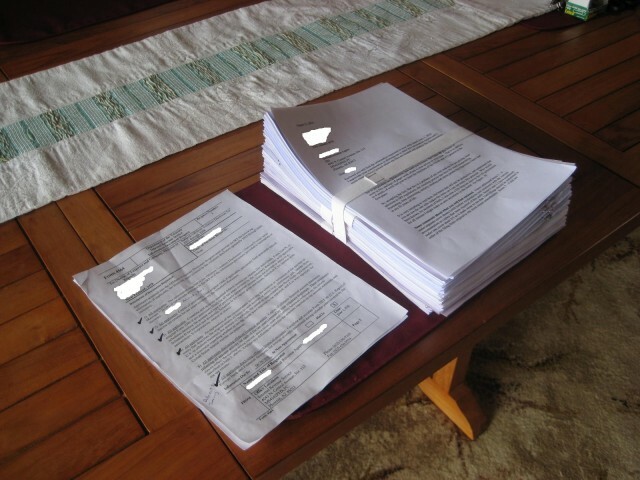 Just Me’s case and documents as presented here were apparently very useful for this opt out. I will certainly add that right away to my links, however, I think we should highlight his as a separate blog post here. Do you have any objections to that? Thank You a thousand times, Just Me. After reading your emotionally, mentally, and physically exhausting odyssey, I came to a conclusion: the OVDP is a brutally absurd program! No wonder my first association while reading your story was Kafka. Thanks again for your excellent post.